All 3 ASX-Listed Outdoor Advertisers had an outstanding 2015 – can they do it again in 2016, and which one is set to shine? 2015 saw a strong year for Australian advertisers, with agency bookings reportedly growing 4.46 percent across all media. While some traditional advertising mediums declined, namely newspaper and magazine, the outdoor ad space saw a somewhat unexpected out-performance with bookings rising 16.2 percent. Over the past 18 months, three major players in this space have listed on the ASX, receiving strong support from the investing community. With LED screen advertising leading the outdoor ad space resurgence, outdoor advertisers saw a year of fantastic growth in both revenues and share price. APN Outdoor Group Limited (ASX: APO) listed in late 2014 and is Australia’s largest listed outdoor advertiser, with a market capitalisation of 966 million. The company operates in both Australia and New Zealand, operating across billboards, transit, rail and airports with both static and digital advertising solutions. APN Outdoor has managed to grow its revenues through several strategic, earnings accretive acquisitions and its ability to convert to its older signage to digital boards. On October 29, 2015 APN Outdoor announced updated profit guidance for the year ended 31 December 2015, raising the EBITDA forecast to $68-6.95M. This forecast reflects an increase on the previous corresponding period of 50%, and outperforms the prospectus forecast by close to 30%. oOH!Media (ASX:OML) is the second largest player in the outdoor ad space, with a market cap of 617m. Listing early 2015, OML has seen fantastic growth, fuelling by a number of strategic acquisitions and strong performance in the outdoor sector. OML boasts coverage of 90% of all major arterials across 5 capital cities in Australia with its outdoor signage. On top of this, OMLs retail signage division reaches 14 million unique customers per fortnight. With the recent acquisition of Inlink, a group with screens through 2,800 offices, cafes and fitness centres, OML has forecast EDITDA of 57-58m for 2016, well above the prospectus forecast of 48.6m. The OML board have also confirmed that they intend to pay a dividend of 40-60% of full year NPAT, after excluding acquisition related costs. 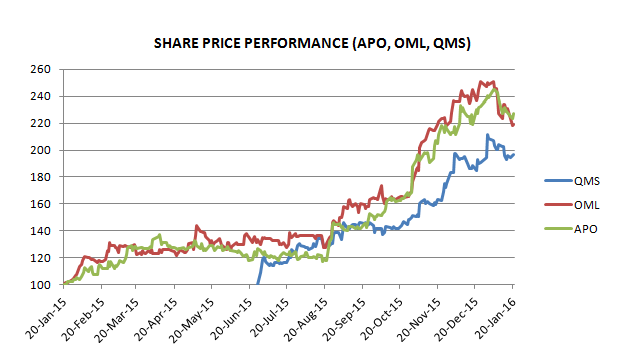 QMS Media Limited (ASX: QMS) is the most recent outdoor advertiser to list on the ASX, following an IPO in July 2015. QMS has a market cap of 371m and have forecast a 12.1m EDITDA for the 2015 Calendar year. QMS recently announced the acquisition of iSite, an earnings accretive acquisition that will give QMS an entry into the New Zealand market. Following the acquisition QMS has forecast and an additional 5.4-5.9m to FY2016 EBITDA . With all three performing outstandingly in 2015, which one, if any is set to outperform in 2016? Firstly, we look to the CY2015 projected results for each of the three companies derived from the interim results and coupled with announced profit guidance. Summarised in the table below, we can see that APN estimates it will have a CY2015 EBITDA of 69.5m, with OML and QMS having 58m and 12.1m respectively. When comparing these figures to each of the companies’ enterprise values we can see that OMLs is the most compelling, with an EBITDA to Enterprise value of 10.6. Looking now at 2015 HY NPAT results, the interim reports from APO reports a profit after tax of 12.8m. This sits favourably when compared with OML, who’s interim results recorded a NPAT of just 3.9m. It is worth noting that OML had significant listing costs, and management believe the NPAT to be closer to 8.5m when these expense items are included. Both of these companies report for the Calendar year, whereas QMS reports by the financial year, making a straight-line comparison difficult. QMS reported a loss of 4.89m for the year ended 30 June, 2015, also weighed down by listing and acquisition costs. A look into each company’s balance sheet also brings makes for an interesting comparison. APO & OMLs balance sheet look similar, both with approximately 360m in assets and roughly two thirds of totals assets derived from intangibles. QMS total assets are lighter in comparison, with only 150m showing on their balance sheet at the beginning of 2015, 90m in intangibles. Another interesting comparison metric is each company’s ability to covert to digital boards, which provide significantly higher monthly returns, and lower maintenance costs. All three companies have reported strong digital conversions, each growing their number of digital assets. Over Q2 2015FY, OML added 10 new digital billboards, with two premium, large, full-motion roadside boards. OML also added 320 new ‘panel’ signs, with 9 large format large format Atrium banners within their retail segment. Digital assets now account for 29% of OMLs revenue, up from 23%. APOs growth in digital assets was also outstanding, with 174% growth in digital revenue. The digital proportion of APOs business now stands for 20% of their total revenue, up from 16%. QMS has seen similar success with it digital assets, growing to currently account for 25% of revenue. QMS has reported that by mid-2016, they will have 36 high quality digital billboard assets, up from 22 in 2015. 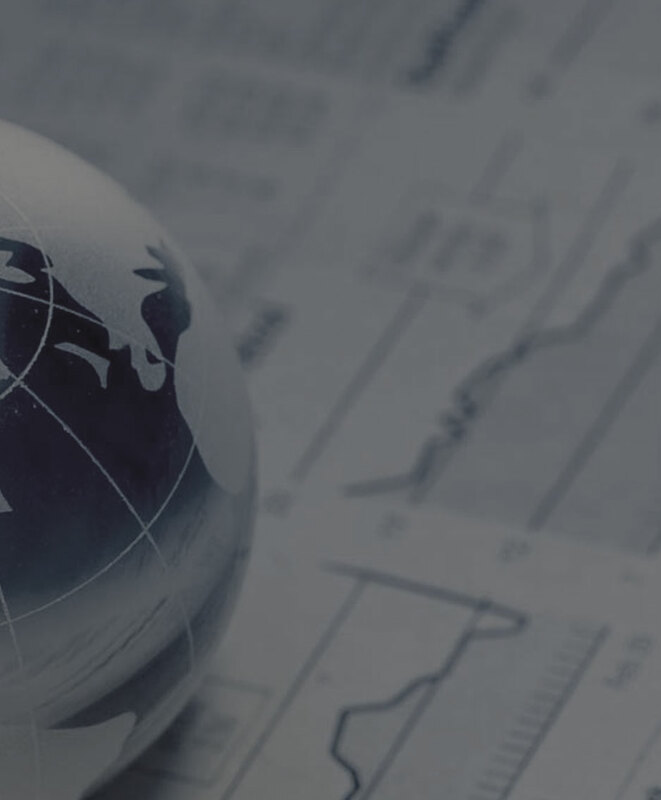 All facts considered, it seems that OML presents the best investment case, with APN likely to remain the sector leader and to lead the three in share price movements. While all 3 are nearing full-value in the short term and approaching all-time highs, the sector has great growth potential longer-term, driven by demand-lead growth in digital signage. While I do see OMLs digital growth continuing, it is worth noting that with 30% of revenue already derived from digital assets, both APO (20%) and QMS (25%) will be able to convert a higher percentage of their existing static assets to increase yield. Relative to its peers however, OML seems the most fairly valued based upon enterprise size to earnings ratios, and should continue to see growth across its business segments. With a heavily diversified range of media offerings, OML should continue to succeed with further earnings accretive acquisitions, and digitally converting static signage in prime geographic locations. Along with these reasons, OMLs management have stated that they intend to pay out 40-60% of NPAT as a dividend. I would strongly consider OML for a long term hold, buying on any share price weakness, with APN to also be strongly considered. QMS should follow, but the fundamental merits of the business make it a riskier hold for now.